The electric cell was first discovered by Lucia Galvani, a professor of anatomy at Bologna University, from the leg of a frog using two dissimilar metals, which was known as animal electricity. However, Alexander Volta believed not in the animal but the dissimilar metals were more important than the frog's leg. Subsequently, Volta did some experiments to show that electricity was produced when two different metals are separated by a non-animal or organic liquid. The outcome of the experiment brought about the crude voltaic cell or simple cell. The Voltaic cell was named after Alexander Volta. Volta constructed a cell which consists of silver and zinc base which was soaked in brine, immediately, he received an electric shock. One disadvantage of this voltaic pipe is the weight of the silver and zinc which is solved by making small cells consisting of strips of zinc and copper instead of silver into dilute sulphuric acid and they are called the simple cell. The pile of the cells is called battery. 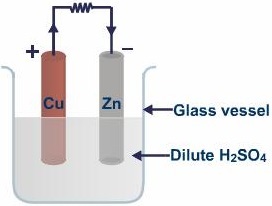 After connecting the cells to a bulb or an electric load, hydrogen atom travels downwards to the copper rod and then the zinc rod. Due to the crudeness in the simple cell design, there is two effect that arises; which are, local action and polarization. Local action is caused due to impurities in zinc and polarization is caused by hydrogen bubbles. Primary cells are cells whose chemical reaction is not reversible that is, they are not rechargeable. The simple voltaic cell is an example of the primary cell. Other examples are Daniel cell and Leclanche cell. Daniel cell consists of a copper vessel containing copper sulfide solution as the polarizer. A porous pot containing dilute sulphuric acid which serves as the electrolyte is placed inside the copper sulfate solution. A zinc rod is placed inside the porous pot to serve as the positive electrode. The Daniel cell usually has an electromotive force(emf) of 1.1V. It has a longer period of working than the simple voltaic cell and not affected by polarization. The only problem faced by the Daniel cell is local action, which is due to impurity of the zinc which serves as the negative electrode or terminal. The Leclanche cell consists of the dry type and the wet type. It has a glass jar which serves as the container. A porous pot containing manganese dioxide and powdered carbon which serves as the depolarizer. A carbon rod placed in the porous pot which serves as the positive electrode. Ammonium chloride in the glass jar which serves as the electrolyte. Depolarization take-place slowly compared to the Daniel cell. The local action does not occur due to the amalgamated zinc due to depolarization. It is therefore used only when intermittent current is required. It has the electromotive force (emf) of 1.5V. The only defect is that it is hard to move from one place to another. 1. 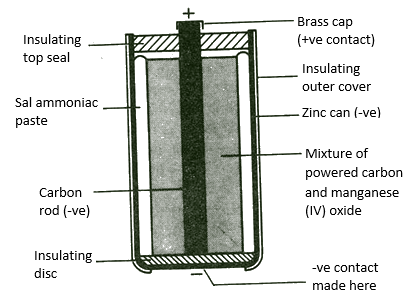 A zinc container which serves as the negative electrode 2. In the zinc container, pastry ammonium chloride or ammonia sac 3. Muslin bag which serves as the porous pot in the wet leclanche cell. 4. In the muslin bag, Manganese dioxide and powdered carbon which is the depolarizer. 5. Carbon rod which serves as the positive electrode. 6. Cardboard disk which serves as an insulator to prevent the contact of the positive and negative electrode. 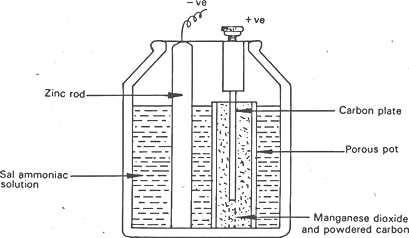 The dry leclanche cell has the same working principle as the wet leclanche; the electromotive force is also 1.5V. The only difference is that the dry leclanche cell can be moved one place to another easily. So far, the basic electric cell has been discussed in this section which a brief introduction to primary cell. In the next article, we shall discuss secondary cell, most especially, the Lithium-ion and Nickel-ion type with various performance criterion. MLA (Modern Language Association) "Electric Cell." ScienceAid, scienceaid.net/Electric_Cell Accessed 25 Apr 2019. Chicago / Turabian ScienceAid.net. "Electric Cell." Accessed Apr 25, 2019. https://scienceaid.net/Electric_Cell. Thanks to all authors for creating a page that has been read 4,693 times.